Cuairt-litrichean: Future Society newsletters will be available here. I hope you’re having a splendid Spring and are getting as much time as possible outside in this lovely weather. Below is our Society’s current programme for the rest of this season: everyone is welcome at any or all of these events and I hope to see you all at some point in the months ahead. May 4th, 8pm: May the Fourth Be with You! A ceilidh featuring a return visit from the Pender Island Ceilidh Band, bringing their lively and eclectic fusion of traditional music influences back to the Scottish Centre. You won’t want to miss this one. Admission $12; free for under-sixteens. 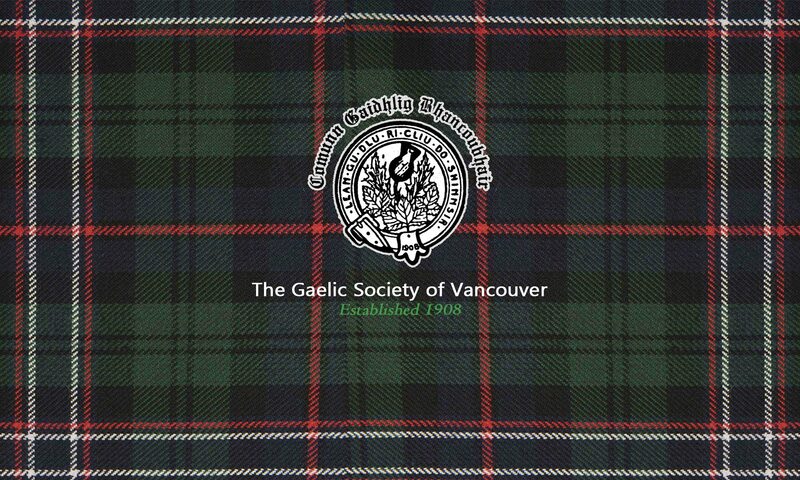 June 14th/15th: The BC Highland Games return, in a new venue this time: Lafarge Lake Park, 1240 Pipeline Rd, Coquitlam, BC. All your favourite events will take place as usual, whether your interest is in piping, highland dance or highland sport. Our Society will have a stall there, also as usual, offering introductions to Gaelic language and music and advertising our language classes. Drop by and visit if you attend the Games (and you’ll certainly want to). June 27th, 7:30pm: our Society will hold its Annual General Meeting, to receive annual reports, elect new officers, and make some decisions about Society assets. I will be standing down as Chief at that meeting and your committee welcomes nominations for that role as for all other roles (all our officers except Immediate Past Chief are re-elected every year: the IPC role is filled by the most recent Chief, currently John McLeod). Please forward any nominations to me or any other committee member at any time before the meeting itself.